Under His Wings – Is It Safe Yet? Years ago when we lived in our cabin in Montana, we were blessed by the beauty of God’s Creation that surrounded us. I can honestly say that there is nothing that we enjoyed more than walking on the property that God had provided for us and seeing all the wild life that lived there with us. On an average day during the summer months, we would see rabbits, turkeys, deer and birds that flocked in for shelter, food and water. Occasionally we would see porcupines, foxes, bears, and mountain lions. It was not unusually to see the wildlife come up around the cabin during drought months as we provided food and water for the animals. The deer would come up and bed close to the house at night too. Many a night I woke up thinking I heard the meowing of a small kitten only to discover that a baby deer was calling out to his momma. There are so many precious moments and stories about these animals that I could share and at times I wished that I had recorded more of them. Today as I read from Psalm 91, I was reminded of an afternoon walk with six of our dogs when we came upon a mother turkey with her brood. It was easy to see that she had lovely yellow chicks walking under her wings just by the way that her wings were spread out and she was walking very slowly. Just a few seconds later, I noted one of the dogs catching a scent of the momma bird and she started barking and running towards them. I shouted out for her to stop but it was too late – she wanted to know what that was on her land. All at once, about 25-30 baby chicks started scrambling out from underneath the protection of their mother’s wings. They were terribly frightened by the barking of the dogs. Clearly momma was terribly upset and she started crying out for her babies to return to the safety of her wings. It was too late, chaos was all about us with some chicks running wildly through the tall grass, others flying and trying to land on the lower branches of trees and dogs running all around barking and two people with absolutely no control over the circumstance who were yelling at the dogs to stop it. I was so mad at that dog for doing that and especially for not listening to me – yet I know that was natural for her to do – to see what was going on up ahead on her land. My momma’s heart went out to this mother turkey – I knew she must have felt desperate and worried about what would happen to her baby chicks. I started praying that God would protect those babies from harm and that some way they would find their way back to the safety of their mother’s wings. Psalm 91:4 – He will cover you with his feathers. He will shelter you with his wings. His faithful promises are your armor and protection. Just 22 words but all the love and wisdom of the Lord flows from those precious words of promises from God. His faithful promises are my armor and my protection. But I must stay under those feathers – those wings in order to be safe and protected. I think of the many times that Jesus must have been walking into the city of Jerusalem and how his heart must have broken each time thinking of how the Pharisees and Scribes felt about him. Their hearts would cold as stone – there was no love in their hearts for the Son of God. 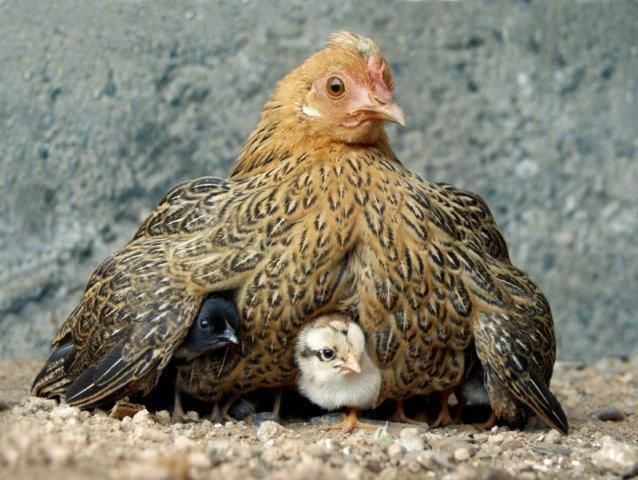 Jesus used the analogy of the mother hen and her brood – oh how he wanted to protect his children, but they wanted nothing to do with him. They were unwilling to accept the gift of the Heavenly Father – His Son. We are all familiar with the comic strip “Peanuts” and one of the characters that clings to his security blanket. Linus feels secure with his blanket – he never leaves home without it. That blanket has been through dirt and mud and snow and rain but Linus will not put it down. 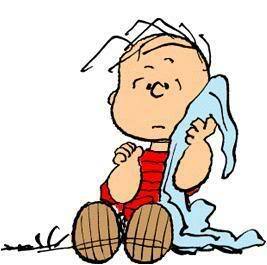 Linus knows that he needs that security blanket – that safety net with him throughout the day. We all need a security blanket of one kind or another. 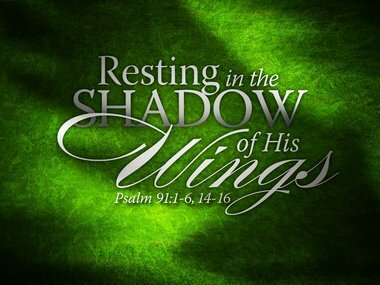 There is no greater security than being under the feathers – under the wings of God. 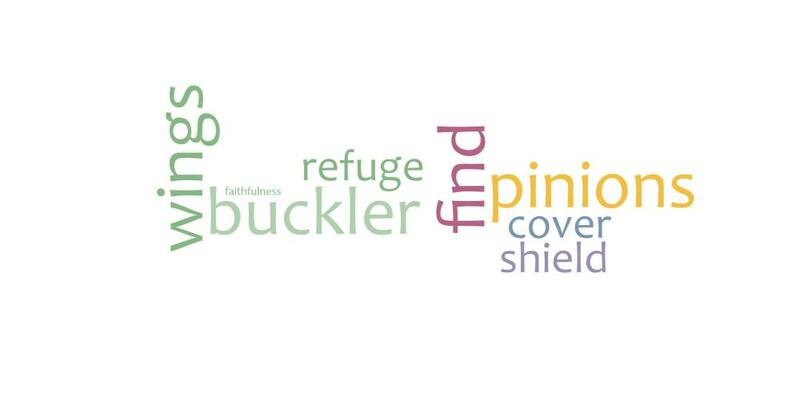 His faithful promises are our armor and our protection. My prayer for you today is that you will experience the love of God – His faithful promises to us to be our armor and our protection – up under His wings. Dear Heavenly Father, what a faithful promise of love – to be under your wings of protection. Thank you Father that we have a safe place to go and be at rest in your arms. Father God, I pray for those who read this blog today will find the peace and joy in their lives that come only from You. I pray that each one can envision that picture of a mother hen and her brood of chicks walking safely up under the protection of her wings. I ask this in Jesus Christ’s name, amen.